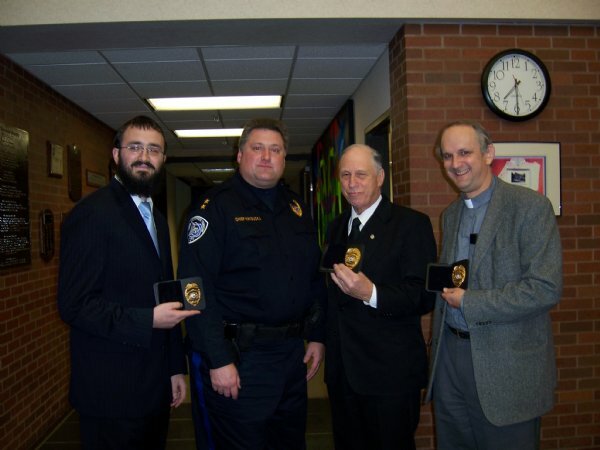 Rabbi Mendy Carlebach was "sworn-in" as one of three South Brunswick Police Chaplains. Joining Rabbi Carlebach was Rev. Hubbard and Rev. Maltby,who was given an updated badge after serving the township for close to 50 years. After a brief introduction by Chief Ray Hayducka, Rabbi Mendy Carlebach was "Sworn-in' by the Township clerk Barbara Nyitrai with his father-Rabbi Yosef Carlebach (NJ State Police Chaplain) holding a Chumash. The text of "swearing-in" was changed for Rabbi Carlebach to say "affirm" and a Chumash was used as the bible.